Claiming Paternity: Myth vs. Realty - Rosi & Gardner, P.C. June 30, 2017 Rosi & Gardner, P.C. Paternity Myth: Putting a man’s name on a child’s birth certificate makes him the child’s father, legally speaking. Reality: The delivering mother can put anyone’s name in the box for fatherhood. Her doing so, though, doesn’t give “John Doe” paternity rights. Notice of Intent to Claim Paternity: If he believes himself to be the unborn child’s father, but the mother will not execute an Affidavit of Parentage with him, he can file a “Notice of Intent to Claim Paternity” in any Circuit Court in Michigan, before the child is born. The mother will be notified of his intent to claim paternity, and the court will send the notice to vital records at the Department of Public Health in Lansing. 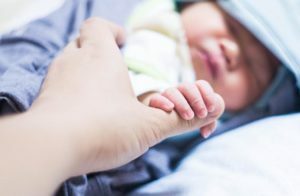 If the child is born in a Michigan hospital, county (Circuit) Courts throughout Michigan will receive notice of his claim, and information about his identity. The claiming father would also then be notified if a court case is filed to terminate his parental rights, such as for an adoption. The notice is admissible in a paternity or custody case, but is rebuttable. You can read the text of the law here. Affidavit of Parentage: If both the mother and father agree that he is the child’s parent, they can sign an Affidavit of Parentage, under oath and in front of a notary. If they do that, the affidavit serves as a legal determination of paternity. He is now a father, with all its rights and responsibilities. You can find that form here. Paternity/Support Case. Finally, a potential father may file a paternity lawsuit, against the expectant mother, before or after the child is born. Through that case, an expectant father can have his paternal rights and responsibilities, and even eventually his parenting time, determined. If either parent requests it, genetic testing can be ordered – after the child arrives, of course – to confirm paternity. The text of this law, which is more complex, as is the paternity/support case itself, can be read here. We recommend that a claiming father seek legal advice and guidance specific to his situation. Where should a paternity case be filed? When should it be filed? Should you sign the Affidavit of Parentage if you are unsure? All of these choices, particularly the latter two, are somewhat complex, and involve lifelong consequences. But, there are options for a man who wants to be a father to his child. Immunity From Prosecution- What is it?